Should We Care More About Violence? Of course we should; violent crime per capita (or lack thereof) is a fundamental barometer of the quality of life and a measure of success of society. Violent crime isn't a desirable quality. With our frenzied twenty-four hour news cycle, you might be getting the idea that all of a sudden the United States is a pretty darn violent place. The facts get in the way of a good story. In July, 2009, British publication the Daily Mail laid out the culture of violence. You might be wondering how the United States ranks compared to Europe? In terms of violent crime, the United States did not rate. The U.S. has a violence rate of 466 crimes per 100,000 residents: it doesn't make the chart at all. All of a sudden the European way, particularly the UK way, loses its appeal. Who wants violent crime rates to increase by 436% in the United States so we can be like the U.K.? Still, of course we want to improve and well we should. It is a fact that most mass shootings happen in gun-free zones. Gun free zones are magnets for mass murder. That is an inescapable fact. Post Offices were associated by the media with mass shootings, by disgruntled workers who were said to "go postal". The fact that guns were prohibited in Post Offices was well-publicized. Office buildings, hospitals, convenience stores, TV studios, chain restaurants and day care centers have all been targets of killers intent on running up a large score of victims before they finally kill themselves. All of these places prevent employees from arming themselves, even if they have a state-issued permit granting them that right. Schools became popular targets for mass-murderers around the time that the Gun Free School Zones act of 1994 was enacted. This law and similar local laws were targeted at gang violence, but had the unfortunate consequence of making schools a far more attractive target for the disturbed who wanted to end their own lives with a dramatic killing spree. Have you ever heard of a mass shooting in a police station, the Gun Club, at the shooting range, or at a gun show? Suicidal mass murderers may be insane, they may be deeply troubled, but they are not always sea-slug stupid. They always select a vulnerable target, a "soft target" for their heinous acts of violence. The high point for mass killings in the U.S. was 1929, according to criminologist Grant Duwe of the Minnesota Department of Corrections. Incidents of mass murder in the U.S. declined from 42 in the 1990s to 26 in the first decade of this century. Until Newtown tragedy, the three worst K12 school shootings in history ever had taken place in either the U.K. or Germany. John Lott noted that the Aurora shooter, who killed twelve people earlier this year, had a choice of seven different movie theaters that were showing the Batman movie he was obsessed with. All were within a 20-minute drive of his home. The Cinemark Theater the killer ultimately chose wasnt the closest, not the largest, not the one with the biggest screen. It was the only one that posted signs saying it banned concealed handguns carried by law-abiding individuals. All of the other theaters allowed the approximately 4 percent of Colorado adults who have a concealed-handgun permit to enter with their weapons. Don't we get the picture here yet? It gets worse. With just one single exception, the attack on congresswoman Gabrielle Giffords in Tucson in 2011, every public shooting since at least 1950 in the U.S. in which more than three people have been killed has taken place where citizens are not allowed to carry guns.-- John Lott. The evidence is there, it is overwhelming and not in dispute: save one incident, every public shooting in the last 62 years in the U.S. in which more than three people have been killed has taken place where citizens are not allowed to carry guns. Eliminate the prohibition of guns by the Responsible Citizen for crying out loud. 62 years of evidence shows we have created mass-murder magnets, soft targets of opportunity. Susann Gratia Hupp has warned of the danger we have unintentionally created with Gun-Free Zones for years. 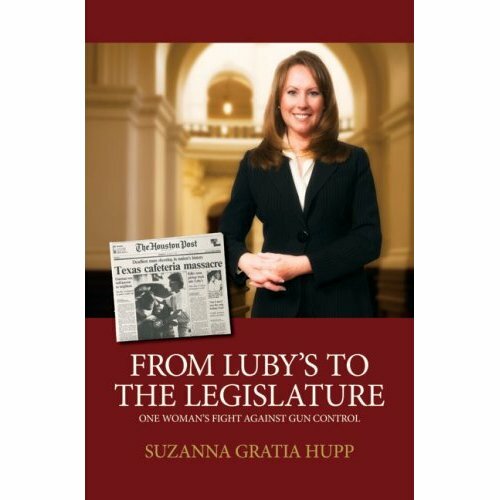 Her story is memorialized in her book, From Luby's To the Legislature, a must-read for every American. Now, who is Gary Kleck? Gary Kleck is a member of the American Civil Liberties Union, Amnesty International USA, Independent Action, Democrats 2000, and Common Cause, among other politically liberal organizations He is a lifelong registered Democrat, as well as a contributor to liberal Democratic candidates. He is not now, nor has he ever been, a member of, or contributor to, the National Rifle Association, Handgun Control, Inc. nor any other advocacy organization, nor has he received funding for research from any such organization. Why should anyone pay attention to Gary Kleck? Gary Kleck is a Professor in the School of Criminology and Criminal Justice at Florida State University. His research centers on violence and crime control with special focus on gun control and crime deterrence. Dr. Kleck is the author of Point Blank: Guns and Violence in America (Aldine de Gruyter, 1991), and Targeting Guns: Firearms and Their Control (Aldine de Gruyter, 1997). He is also a contributor to the major sociology journals, and in 1993 Dr. Kleck was the winner of the Michael J. Hindelang Award of the American Society of Criminology, for the book (Point Blank) which made "the most outstanding contribution to criminology" in the preceding three years. The boringly scholarly approach of criminologist Gary Kleck is exactly what in needed. What we don't need is Einstein's definition of insanity: The definition of insanity is doing the same thing over and over again and expecting different results." That also defines the value of the so-called assault weapons ban and other pieces of paper that while presented as doing something, have not been shown to accomplish anything. We certainly don't want to aspire to become as plagued by violent crime as Great Britain, Austria, or South Africa either. None of these nations have a Second Amendment. In Great Britain, using a firearm to save your own life is considered unacceptable. Since 1968, "self-defence" has not been considered a valid reason to own a firearm. 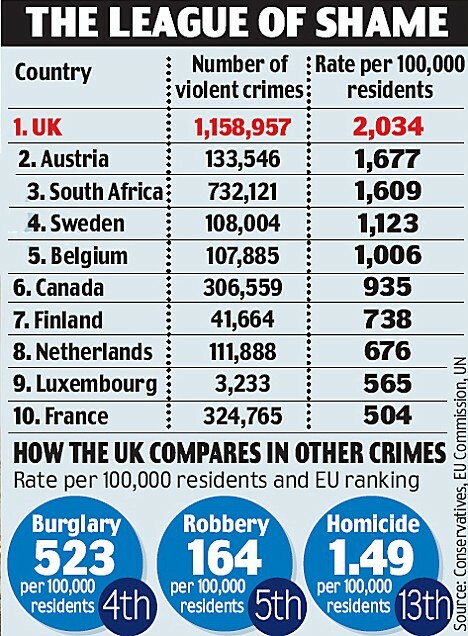 Great Britain is a world leader in violent crime rates, topping the "League of Shame." What of the children? Every hour, one child dies from an unintentional injury in the United States. Its the leading cause of death for children and adolescents aged 1 to 19. Why is it that the leading cause of death gets no discussion? Topping the charts for unintentional death is car crashes, with poisoning and suffocation on the rise. The most common cause of death from unintentional injury for children is motor vehicle crashes; other leading causes include suffocation, drowning, poisoning, fires, and falls. Let's not forget intelligent, well-researched bodies of evidence. Consider the work of Gary Mauser, Professor Emeritus, of Simon Fraser University in Canada. For over 20 years, his academic research at SFU has involved studying firearms and crime. A study he did with constitutional lawyer and criminologist Don B. Kates has been recently published in the Harvard Journal of Law and Public Policy. "Politicians often think that banning guns will be a quick fix. But gun bans dont work; if anything, they make matters worse. They disarm the law-abiding, yet are ignored by the violent and the criminal. Nations with severe violence problems tend to have severe gun laws. For example, countries as diverse as Jamaica and the Republic of Ireland banned legal civilian possession of virtually all firearms in the 1970s, but homicide and gun homicide rates have more than tripled. By the same token, the murder rates in handgun-banning US cities including New York, Chicago, and Washington, DC are far higher than in states like Pennsylvania and Connecticut, where handguns are legal and widely owned. . . research shows that banning civilian guns increases peoples vulnerability, fails to reduce violence, and merely empowers criminals and terrorists at the expense of the innocent. These research studies are available on my website, garymauser.net," wrote Gary Mauser to the United Nations. We know that guns save far more lives than they cost. Improvements can be made in many areas, the leading cause of death for kids 1-19 is unintentional injury. School-shootings don't rate a blip on the radar. Nevertheless the evidence tells us what needs to be done: we need to eliminate the murder-magnet we have created, the "Gun Free Zone." And, Lord help us, we sure don't want to sink into the violent crime plagued realm of the UK, Austria, and South Africa. We need to care more about preventing violent crime; we need more scholarly, dispassionate, factual discussions . . . not shrill, ratings-grab attempting froth.